In the context of the Arab Spring uprisings, Syrians rose up in March of 2011 to call for the end of dictatorship of Bashar al-Assad, whose regime has continued the brutality of his father Hafez al-Assad’s rule, begun in 1971. The uprising was, and continues to be, violently repressed by the Assad regime. The Syrian government has used highly destructive barrel bombs, chemical weapons, siege and starvation as tools of war against their own people, and have prevented access to humanitarian relief. In addition to the Bashar al-Assad regime’s crimes against humanity, the war now also involves a host of regional, sectarian, and global actors all fighting their own wars, including the United States, Russia, Iran, Al Nusra Front and ISIS. There is an urgent need for serious engagement by the international community to end the war in a manner that respects the demands of the Syrian people instead of the various parties pushing their own geopolitical and sectarian agendas. Many assume that ISIS is committing the war crimes driving Syrians from their homes, but the truth is that the vast majority of Syrian civilians killed — more than 95% according to human rights groups — have been killed by the regime of Bashar al-Assad. The United States bears no small responsibility. The Syrian war — and particularly the rise of ISIS — has everything to do with U.S. actions dating back to the 2003 invasion and occupation of Iraq, which gave rise to ISIS in the first place. Even now the U.S. airstrikes in Syria and neighboring Iraq are escalating the war in both places. 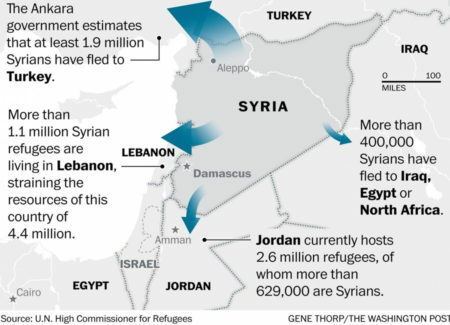 At least 4 million Syrians have fled their homeland since 2011, while millions more are internally displaced. 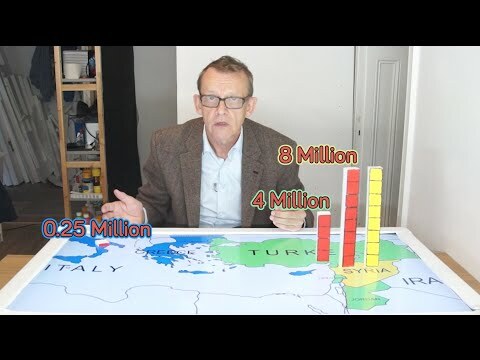 Most refugees have gone to neighboring countries. The EU prevents the vast majority of Syrians displaced by the war from applying for asylum from countries close to home, which necessitates the perilous journeys refugees are taking to reach EU territory in order to gain asylum. Meanwhile, just under 2,200 Syrian refugees were allowed into the United States in 2015, a number that reached still a mere 10,000 in 2016. As poet Warsan Shire has said, “no one leaves home unless home is the mouth of a shark”: this devastating and urgent refugee crisis is a humanitarian disaster grown from the deeper political disaster of the war in Syria. Ending the refugee crisis must start with freedom and justice in Syria. What’s happening to civilians in Syria? Background info and graphs. Palestinian refugees in Syria, long awaiting return to Palestine, are now refugees once more. They are barred from entering any of Syria’s neighboring countries except Turkey, and if they do make it, they face rejection from refugee camps, humanitarian organizations, and likely deportation back into the Syria they fled. The Yarmouk refugee camp was once home to nearly 200,000 Palestinians. Yarmouk has been under attack and siege by the Assad regime since 2012. Its population has been decimated as tens of thousands have fled to escape barrel bombs, arrests, and a devastating siege. Now, only 18,000 people remain in Yarmouk. Although the Assad regime has cast itself as a cornerstone in the Arab axis of resistance to Israel, it has in fact had a very cozy relationship with both the US and Israel: for example bombing Iraq in 1991 and sponsoring attacks on Palestinians during the Lebanon war. Petition to the Obama White House to resettle at least 65k refugees in the US by 2016. Sign this petition urging heads of governments to implement humane refugee policies. Sign this petition demanding that the UK government to accept more asylum seekers and provide better support to refugees. Sign this petition on the need for accountability and justice from Manbij to Ghouta to Aleppo. Volunteer with the International Rescue Committee. Write about the crisis. Share stories and amplify migrants’ voices. Advocate for Syrian voices in the media. Write a letter to the editor. Invite a Syrian to come speak at an educational event.